The Enterprise finds the remains of the S.S. Beagle, lost for six years, and tracks it to a planet that, based on broadcasts, is “20th-century Rome.” Kirk, Spock and McCoy beam down (natch) to look for survivors and are captured by a group of runaway slaves who (apparently) worship the sun. Working around the Prime Directive, which he cares about in the second season, Kirk gets the slaves to take the Big Three to the capitol. Shortly thereafter, the group is taken prisoner, and learns that the Beagle’s Captain Merrick (William Smithers) has violated the Prime Directive in order to survive, even telling the Roman Procounsel Marcus (Logan Ramsey) about the Federation. 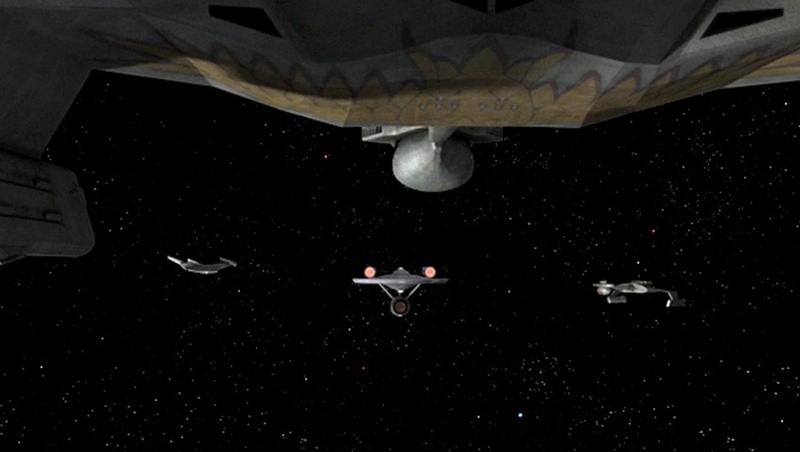 Kirk refuses to beam down the Enterprise crew to engage in coliseum-style battles and (after — hehe — being thrown a few curves) faces execution. He manages to escape thanks to some unbelievably timely assistance from Scotty on the ship and then frees Spock and McCoy. 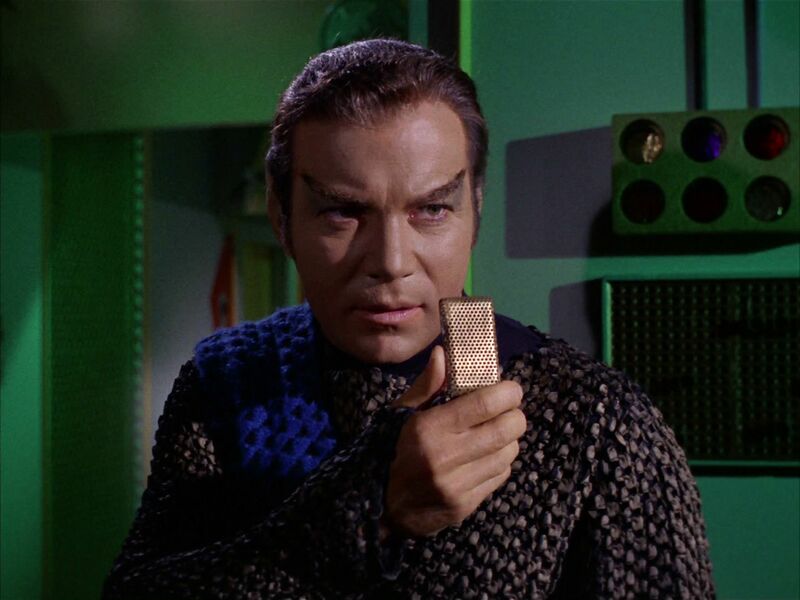 As the Romans close in on the trio, Merrick — who had been emasculated by the procounsel for much of the episode — tosses a communicator to Kirk allowing the trio to beam out. 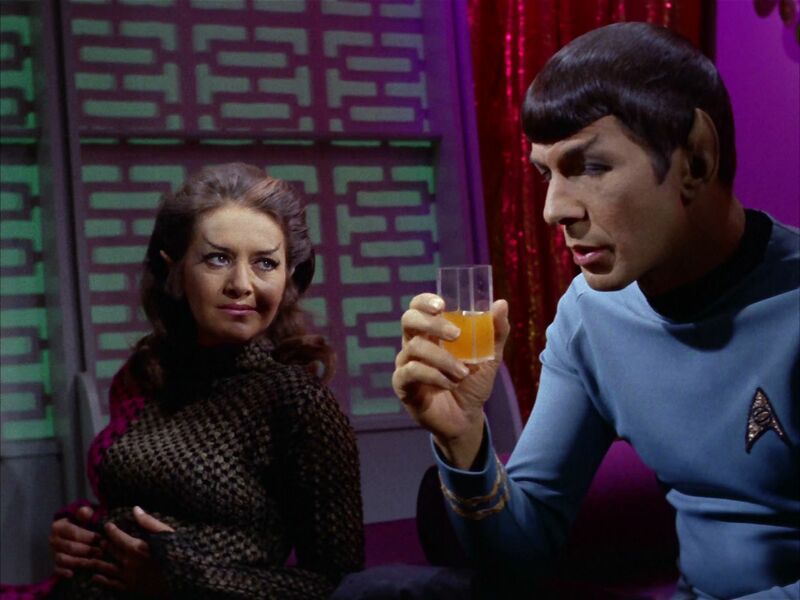 During the typical postgame wrap-up on the ship, Uhura tells Kirk that the slaves were actually worshiping the son of God, based on broadcasts she’s been monitoring. Kirk expresses wonderment that the planet is about to find Christ in the 20th century … and sets course for the next mission. This is the first episode that really explains the Prime Directive, which is first mentioned, and then promptly ignored by Jimbo, in “Return of the Archons”. It’s also another example of the goofy parallel-Earth trope that TOS made us sit through three to four times a season (clearly, to save money). Also mentioned here is Hodgkins Law of Parallel Planetary Development as a quick (and actually pretty weak) way of justifying why so many planets are Earth-like. More on that in a moment. 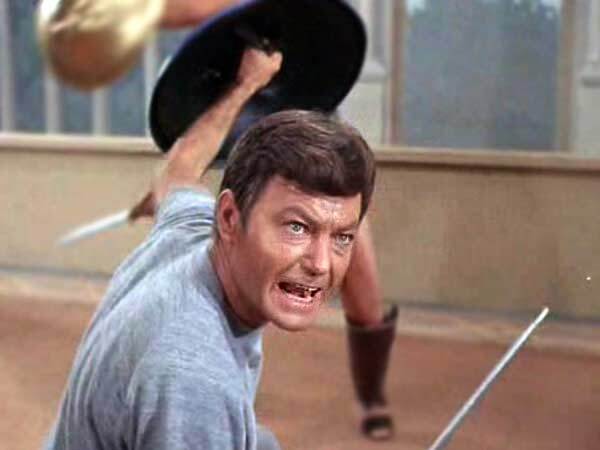 Aside from the Prime Directive exploration, it’s probably important to review an episode like “Bread and Circuses” on this site, as finding Earth-like planets was such a big part of TOS. This episode is the one that best explains why such planets keep popping up, which is to say, it provided any explanation at all. TOS was just all over the place as far as the Prime Directive. At times — like in this episode — it’s something that Kirk says can’t be bent at all, even if it means his life and his crew are forfeit. At others, Kirk breaks it if his ship or crew is in danger, if he thinks it’s the right thing to do or if he just thinks chicks really dig outlaws. In this episode, as he Spock and McCoy are facing certain death, he refuses to break the order. I actually don’t take issue with Kirk breaking the Prime Directive in some instances, as doing so is in keeping with his character. But it’s just ridiculous when he goes all Joe Friday about enforcing it in episodes like this. I know that TOS was written with less regard for continuity and that complaining about Prime Directive violations is odd in a series with episodes about brain theft, space hippies and crewmen evolving into lizards after going warp 10 (wait, that last one was Voyager). But still. As for this Hodgkin’s Law business, it’s an odd throwaway line (during Kirk’s log entry) in this episode and never really mentioned again, despite other parallel-Earth episodes. Even if you figure it wouldn’t be applicable when outside forces made planets Earth-like (“Patterns of Force,” “A Piece of the Action”, “The Paradise Syndrome”) it’s totally applicable for two of the series’ worst showings in “The Omega Glory” and “Miri”. And yet, it’s only mentioned here. And if Kirk is really as gung-ho about the Prime Directive as he appears in this episode, his planning abilities are just awful. 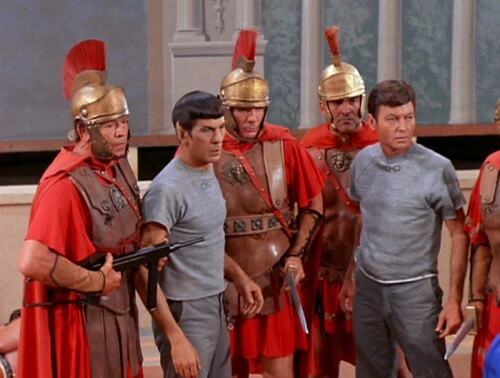 Why Kirk, Spock and McCoy would beam down to the planet — wearing their uniforms way out in the sticks — as a way to investigate “20th century Rome” is just laughable. Do they think they’ll figure anything out on their hike to the city without being discovered? In other episodes, Kirk and Co. dressed like the locals to fit in. Maybe they really do need a ship’s historian? Oh, and while I did like Scotty’s idea to cause a power outage as a show of strength, it’s just crazy that the timing works SO well. 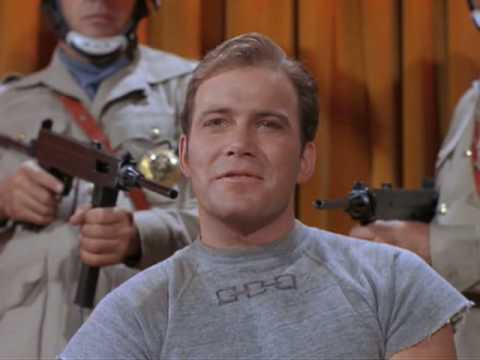 What if Scotty had turned the lights out while Kirk was being given one last “night as a man” by the procounsel’s slave girl? Of course, there’s the big item in this episode, which is the reveal that Christ is coming to 20th-century Rome. TOS had the most instances where some sort of religion was obliquely mentioned — e.g., the “laws of man and god” in “The Ultimate Computer” — but it’s really pretty overt here, while still leaving a LOT open to interpretation. I’m not sure how I feel about it, really. The final scene could simply paint Christ as a key philosopher, but not a religious figure, in the eyes of Kirk and Co. Earlier in the episode, Bones does say that they have “many beliefs,” possibly implying that not everybody (or every 23rd-century human) is a Christian. Or … you can watch the scene and come away feeling as if the idea that Christ was some sort or religious savior is SO obvious to crew of the ship that they DON’T need to explain that they’re all Christians. It’s clever in a way, but so odd that I can’t quite get behind it. As it stands, it’s just a head-scratcher.